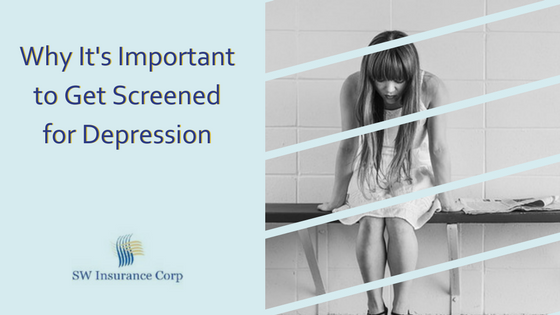 Why It’s Important to Get Screened for Depression | SW Insurance Corp.
Depression affects more than 8.2% of the U.S. population. That’s nearly 20 million adults, so even if you don’t suffer from depression yourself, someone you know has been affected by this disorder. Over 80% of those treated for depression show definitive improvement in their symptoms within six weeks of beginning treatment, yet less than 35% of depression sufferers seek treatment. There is a stigma associated with depression. It’s not measurable, but it can be oppressive. The most important thing to realize is that depression is treatable. That hopelessness doesn’t have to continue. October 5th is National Depression Screening Day. It’s a part of national mental health awareness month. This year’s theme is #SpeakYourMind. The goal is to get you to share your experiences. Finding out that you’re not alone, and that depression strikes no matter your status, job, or measure of success. Depression doesn’t discriminate. Share your story to help yourself and others like you. Become an advocate for those who are afraid to speak up. You can locate a mental health screening site in your local area or take an online screening by visiting http://www.helpyourselfhelpothers.org/. Thousands of organizations host National Depression Screening Day #NDSD events every year. Don’t let depression control your life. It’s a common and treatable mood disorder. Here are some other facts that you should know. Men are more likely to seek treatment for physical symptoms of depression rather than the typical symptoms associated with the disorder. Men also die by suicide 3.5 times more often than women. Suicide is the leading cause of death for men under the age of 35. Depression isn’t a weakness. Getting help before the symptoms become overwhelming can be the difference between life and death. Depression also affects our youth. Self-medicating through substance abuse, self-injury, and more are common, especially in America’s youth. On average 64% of youths with major depression don’t receive mental health treatment and approximately 8% suffer for at least a year at a time. Taking the time to get screened for depression is the first step to developing a treatment plan and taking care of yourself. Utilizing your health insurance coverage is the best way to get help. The Affordable Care Act (aka ACA / Obamacare) provided one of the largest expansions of mental health and substance use disorder coverage in a decade. It requires that most individual and small employer health insurance plans cover mental health and substance use services. Also included are rehabilitative services that can help people with behavioral health challenges. These new protections are part of the Mental Health Parity and Addiction Equity Act of 2008 which expands these benefits. With the Affordable Care Act, most health plans, including Medicare and Medicaid must cover preventive services, which include depression screening for adults and behavioral assessments for children, at no cost. Most plans cannot deny you coverage or charge a higher premium because of a pre-existing condition, including mental illness. If your company needs a review of their employee medical benefits to ensure this is covered, give SW Insurance Corp a call at 720-344-1105.